Jhunjhunu, in northern Rajasthan, is known for its grand havelis and the frescoes on their walls. But they weren’t on prime minister Narendra Modi’s mind when he spoke of the desert town in his Mann Ki Baat radio talk of March 2018. What he focused on, instead, were the government schools in the district, which have transformed themselves and have attracted 6,000 students from expensive private schools. Modi also lauded headmasters and principals of government schools for the turnaround. Much of the work on encouraging and empowering the principals to improve their schools and student enrollment was done by the Piramal Foundation for Education Leadership (PFEL), which has been working with government schools since 2008. Besides this, the foundation coaches students of government schools for entrance tests to medical and engineering colleges, IITs and other professional institutes. It also helps them prepare for exams leading to government jobs. But the most appreciation the foundation has earned is for its work in improving government schools. The Shaheed Col JP Janu Senior Secondary School is a shining example of the foundation’s work. As many as 980 students were enrolled for the 2018-19 school session, the highest in the state. In four years, student strength went up from 385 to 1,724. The number of girl students went up from 27 to 317. Its principal, Maniram Mandiwal, 49, says that as a teacher, he would always tell himself that when he became a principal, his grand aim would be the holistic development of his students’ personalities; but when he did become a principal, his mundane but most urgent problem was to get his school to work its full hours instead of winding up by lunch. He says that in all his years as an English teacher at the school since 2008, the school had closed down daily by lunch hour. He’d have to tackle that before translating his vision into plans, timelines, and checklists. Mandiwal worked to improve the school, donating as much as '1.5 lakh for new facilities. By energising the administration of the school, he brought it to a stage where he could start getting people living nearby to enroll their children in his school rather than private schools – which he calls “public schools”, because many private schools are named so, for example, Bright Public School and Delhi Public School. “Public schools conduct annual day functions, during which they market themselves by showcasing students’ talents. Because of this, they are able to command hefty fees. 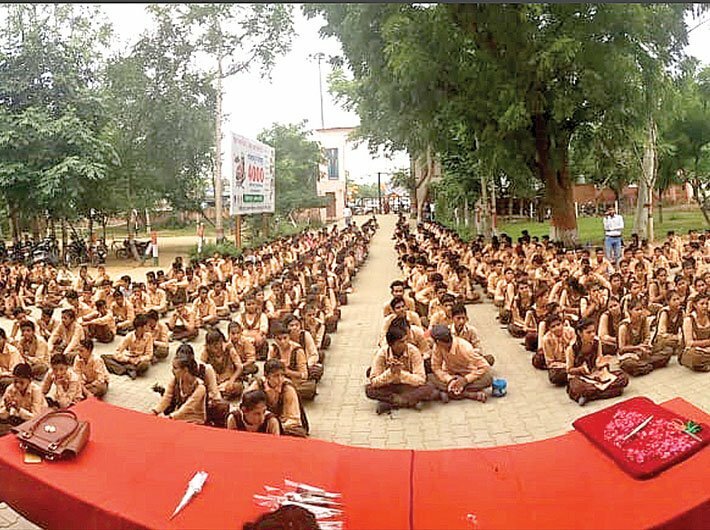 I decided to conduct Dastaan-e-Jhunjhunu on a large scale to convey that this government school focuses on extracurricular activities too, that we are as good as public schools,” he recalls. Government school staff don’t get a chance to interact with the community, but the sabhas became a way of reaching out, he says. They helped raised awareness about how the school nurtured talent, and as a result people were willing to donate money for infrastructure or educational aids. “Now,” says Mandiwal, “we don’t depend on government funds for getting the walls painted and decorated, for getting electrical fittings, etc. 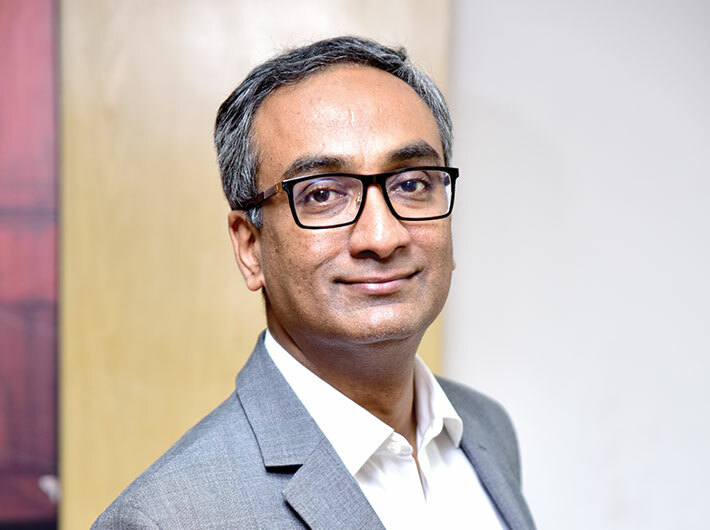 Aditya Natraj (pictured here), the brain behind the Piramal Foundation for Educational Leadership (PFEL), says the core idea driving his institution is: headmasters and principals of government schools can be trained and motivated to become changemakers who vitalise their schools and bring them on par with private schools. So far, results in Jhunjhunu district have been promising. Natraj, a chartered accountant, was well-settled in London. But when the earthquake struck Kutch, in Gujarat, in 2001, he joined Pratham, a voluntary group, to work in Kutch and manage nearly 300 volunteers to restart government schools after they were rebuilt. That was his first step into the voluntary sector. That was where he learnt his first lessons. Kutch, India’s largest district, was a huge challenge. Teachers were mostly from other districts. When he began, villagers couldn’t volunteer to help. The men would be at work, and most of the women were illiterate. The district had the lowest literacy rate for women in the state. He recalls that they started by teaching volunteers soft skills. For the next five years, Natraj worked with Pratham, travelling across the country. He says he observed that 60-70 percent of government officials and staff worked in consonance with the mood at government offices, 10-15 percent were lazy and corrupt, and another 10-15 percent were honest, highly motivated, and did exceptional work, like Patel, despite the low pay and bad policies. He said he decided it would be best to bank on the highly motivated. Natraj says he realised that principals were managers, teachers, and social workers rolled into one. A principal has to stop thinking like a teacher and start thinking strategically, building and motivating a team to transform his vision into reality. Towards this, Natraj launched the Piramal Foundation for Educational Leadership, under the Piramal Foundation, in 2008 and put 81 principals through a workshop on how to manage schools, motivate teachers, make learning more interesting. Besides staff, there are Gandhi Fellows of the foundation recruited from colleges around the country who help principals in implementing their plans. Natraj compares teachers from India with those of the US: in 37 out of 50 states of the US, teachers go to university to complete a masters in school leadership. Candidates can apply for a principal’s post only if they have five years’ teaching experience plus the masters. In India, he says, every field requires specialised training, but teachers and principals are expected to acquire the skills without passing any course. He also observes that the language of school management and administration, left by British rulers, reflects colonial attitudes of control, revenue collection, maintenance of a rigid system, the kind of language used in law, police work, etc. – transfer, monitor, inspect, suspend. But principals and teachers do not work best in those contexts. He says he developed a curriculum the way IIMs developed it, starting out by training managers and then building a course case study by case study. After signing MoUs with government, the foundation would encourage principals to volunteer for the training. They were treated with respect and asked to share their experiences. Drawing on these, a course evolved. In 2013, the Piramal Leadership School was set up, offering the three-year principal leadership development programme. The school hopes to offer masters degrees soon, in the following specialisations: educational leadership, district education management, coaching for school improvement, instructional design, educational assessment and policy design. Training at the school is said to have worked wonders – in attendees and in schools. Foundation staff say a headmaster’s wife came to them and asked, “What have you done to my husband? One day, we saw a child picking garbage and my husband went up to him and started speaking to him. He had never done that earlier. All that concerned him before the course was making money somehow.” Another headmaster burst into tears recounting how, for the first time in his 25 years at the school, a child held his arm and asked him not to go home but stay. Earlier, children would eagerly await his departure so that they could feel freer. Natraj says the government should start looking at its teachers as social workers who are in touch with remote regions. By changing attitudes of people, they can heal all the caste, gender and communal strife facing the country. Natraj now plans to open a second PSL by 2020, near Jaipur, in partnership with the state government. Fourteen special courses are being planned for it. Academics has also improved. A Std X student scored 93.6 percent in the board exams, the pass percentage has improved from 44 to 79. The school uses smart classrooms for students of Std VI to Std XII. Science teaching is augmented with videos, etc. to make the learning process innovative and engaging. Thirty kilometres from Jhunjhunu, in Gowala, the Shaheed Mahipal Singh Senior Secondary School is scripting a story similar to Mandiwal’s. The painted walls, unusual for a government school at the very end of a rickety, unmetalled road, speak a story of change. They were painted by volunteers from the Piramal Foundation, along with student participants. A few months back, Patitapaban, who works for the foundation, saw that students were under immense pressure. He proposed a no-bag day: on Saturdays students arrive without school bags and learn in an atmosphere of fun. The response from students and teachers was so good, the state government decided to introduce no-bag days in schools across the state from September 2018. What the Piramal Foundation learns through such experiences, it integrates into its strategy for schools in 29 districts across 15 states. Many of its interventions have beein praised in the Niti Aayog’s repository of good governance and best practices.